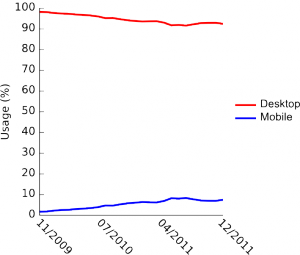 One of the big questions right now is whether mobile devices will replace or supplement existing desktop/laptop usage. 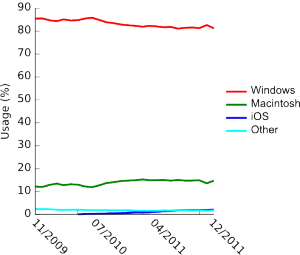 The first thing that jumps out at you is that Windows usage drops by 5.2% since mid-2010, down from 61.8% to 56.6%. But where’s that loss going? Those people must be using something else instead, and the question is what. 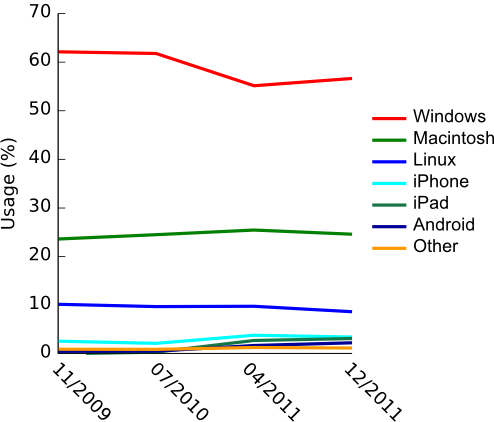 In the same time period, there’s more subtle growth in all of the mobile OSs we measure (iPhone, iPad, Android), for a combined increase of 5.8%. 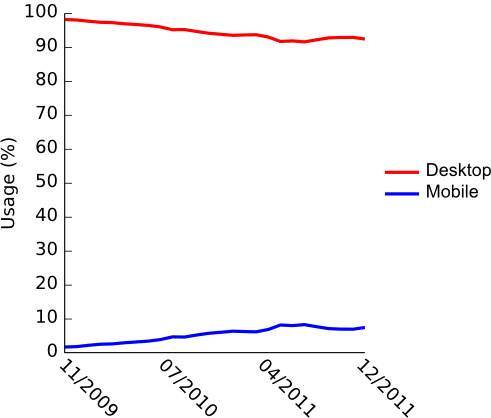 Mobile users now account for nearly 10% of our visitors, tripling from just a year and a half ago (so James, time to set up a mobile theme on your blog!). 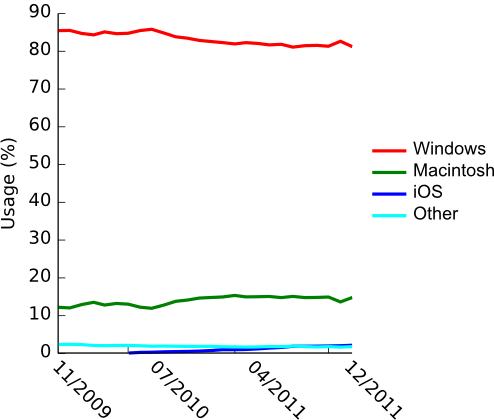 As you can see, Windows dropped by 4.6% (to 81.2% from 85.8%), while everything else held constant or increased (Macintosh went up by 2.8%), again supporting the trickling flow of Windows desktop use toward mobile devices. Since Microsoft’s still struggling to get traction as a competitive mobile OS, they should be seriously concerned about this threat to its core businesses of Windows and Office. Of course, they’re already responding in the form of a touch-friendly Windows 8 and a continued push on Windows Phone releases, but things are not looking good at this point. One of Microsoft’s biggest assets is its huge ecosystem of developers running a full Microsoft stack. It should be doing everything it can to push them toward developing for Windows-based mobile devices, because a plethora of apps is a big draw for potential mobile buyers, and the lack thereof will stop them in their tracks. 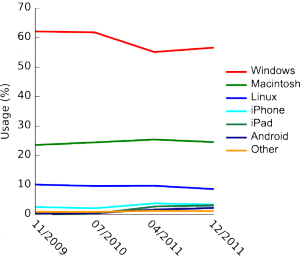 Disclosure: Microsoft is a client, Apple and Google are not. Linux vendors Red Hat and Canonical are clients. Why you need to come to Monki Gras (OR, a Monktoberfest redux) » « What will I cover at RedMonk?